Since my last update I added some compartments for plane storage. I found it easier to apply the finish with the cabinet hung on the wall. Using blue painter’s tape as a mask I wiped on two coats of finish. Since this is essentially a tool box which will receive a lot of heavy and harsh use compared to a piece of furniture, I decided two coats was enough. Normally, for a furniture piece, I would have applied five to seven coats. In the right half of the cabinet I placed the bench (smooth, jack, fore and jointer) and shoulder planes. Block and rabbet planes are smaller and are placed in the left side. Since most of my files, chisels, squares, measurement and construction tools will be placed in the doors I fitted the left side cabinet with shelf pins. This will allow me to place frequently used materials, such as pocket screws, in the left side where they will be close by and easily accessed. I also decided on two wide drawers versus four narrow ones for miscellaneous tools. This will allow me to place items in the draws that are longer than 12″. Since my last update I visited Lie-Nielsen Toolworks to pick up my new Lie-Nielsen workbench shown in the picture at right in front of my tool cabinet. 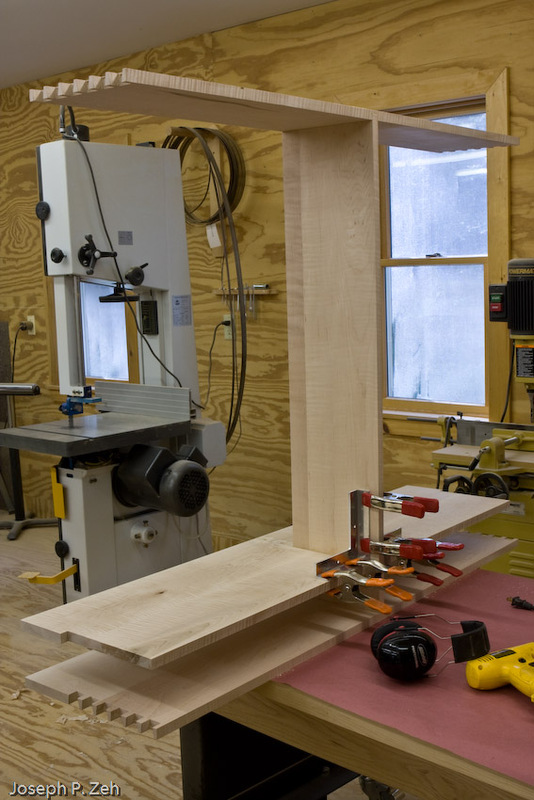 Together these two pieces will provide a hand tool work area that will make for efficient working of wood, especially dovetailing, edging and smooth planing. 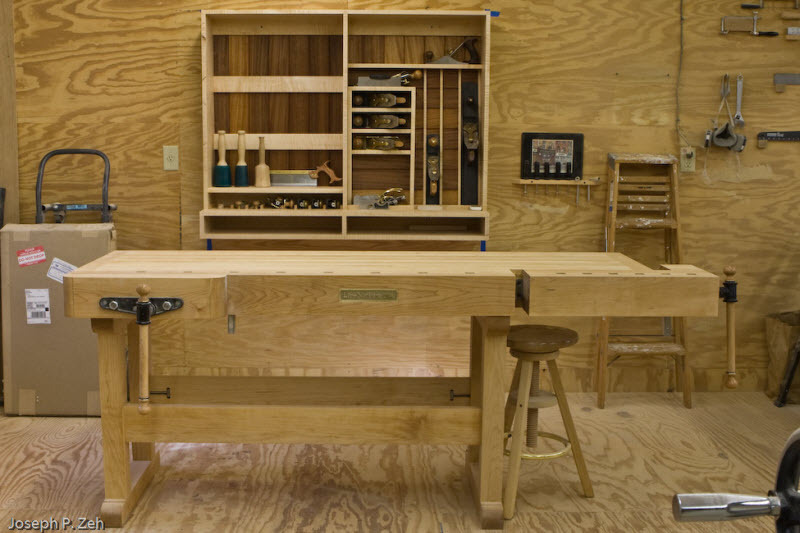 Though shown so that the vices can be seen in the picture, in reality I will turn the bench around so that I will be positioned between the tool cabinet and the bench vises, making all tools within arms reach. I will shortly post a separate blog describing my visit to Lie-Nielsen Toolworks and will also provide a short review of the workbench. My next update will hopefully be my last for this project and I will have the drawers and doors completed. Stay tuned. Since my last update I have focused on the carcass – cutting all remaining joints, sanding, gluing up, adding the back and beginning the placement of tools. 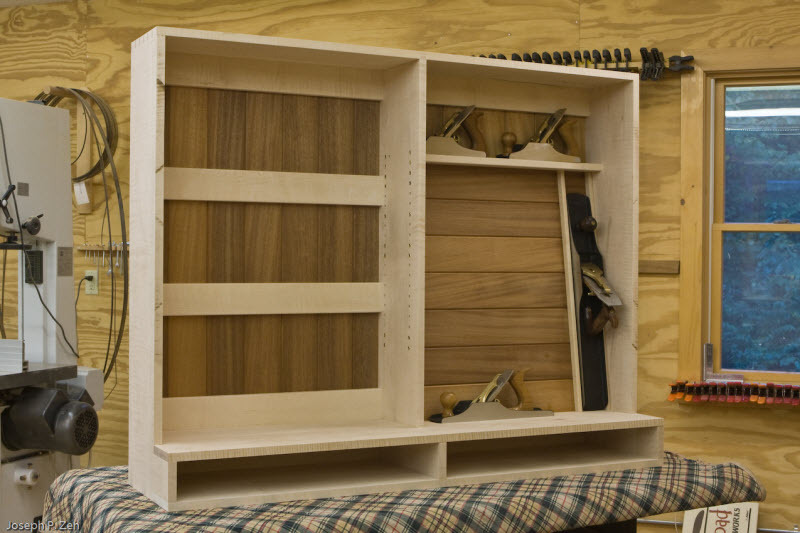 The divider attaches to the top and bottom with a sliding dovetail. I use the router to cut this joint. To be sure that the dovetails line up perfectly, and to minimize tear out, I clamp both the top and bottom together and make one cut as can be seen in the picture at left. 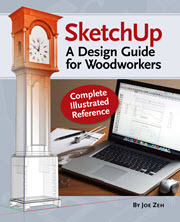 In the picture at right you can see there are many types of joinery employed in this design. The top, bottom and sides are joined with hand cut dovetails. The divider connects to the top and bottom with a sliding dovetail. 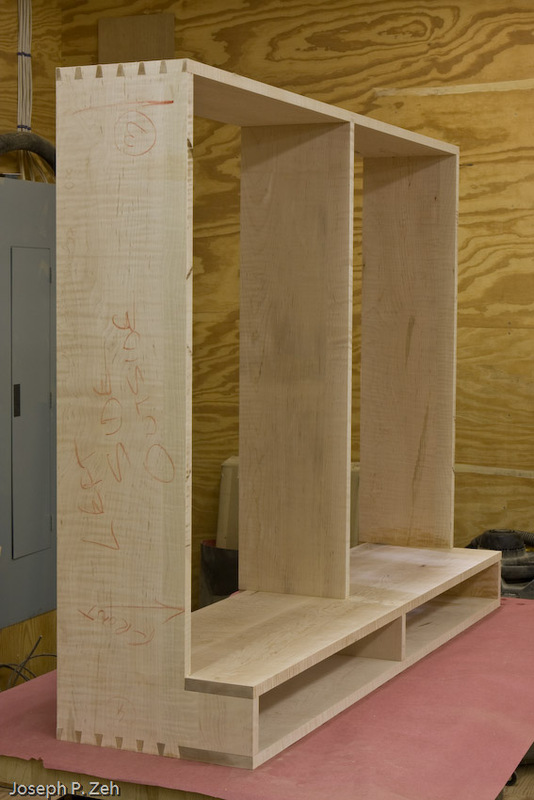 The shelf attaches to the sides and divider with 1/8″ dadoes. In addition there are a number of stopped notches. In some places I used counter sunk screws. 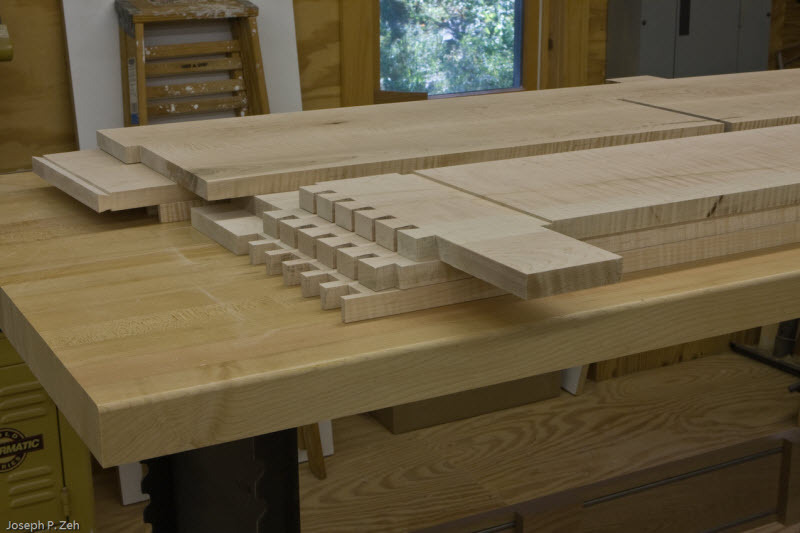 With this many joints and joinery types, dry fitting and developing a glue up strategy is very important. I never bypass these two important steps for expediency sake. This design, in particular, will trip you up for sure if you do because it fits together much like a jig saw puzzle. In the picture at left you can see a test fit of the stopped notch in the shelf and the 1/8″ dadoes in the divider. 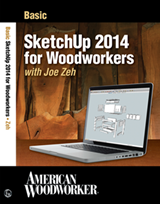 In this way each piece is incrementally added and a glue up strategy developed. Before beginning glue up I sand all inside faces to 220 grit shown right. Doing this after clue up would be very difficult and time consuming. I will have to lightly sand each inside surface after glue up to remove any raised grain caused by cleaning up glue squeeze out, but that can be done very quickly. 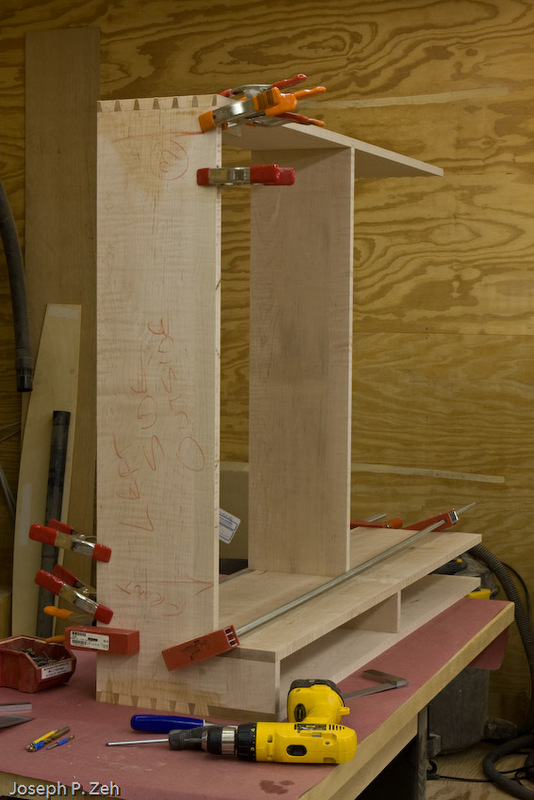 For this design I chose to begin the glue up by attaching the divider to the bottom via sliding dovetail first. Using metal right angle brackets and clamps I allow the assembly to set up before moving on. Next I add the top and shelf in that order as shown in the picture at left. 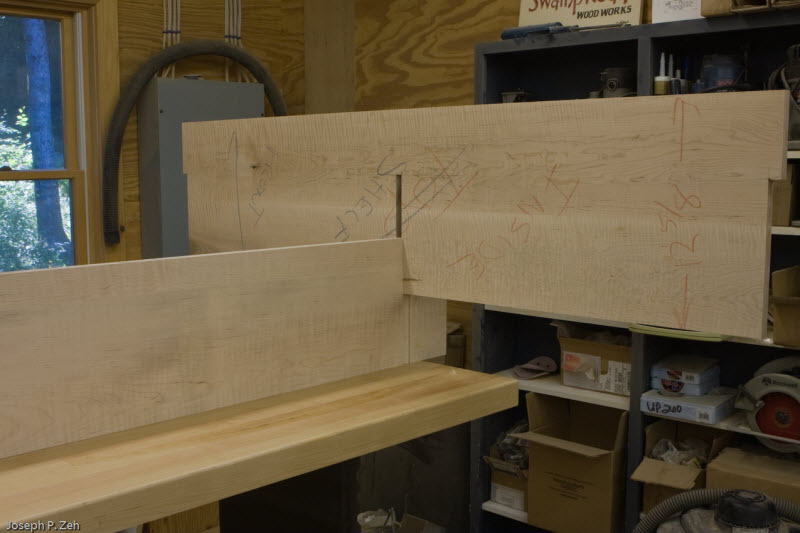 This allows the ends tails to slide into the top and bottom pins, and the shelf’s notches to slide into the sides dadoes when adding the ends. The day I glued up the ends I was unable to enlist any help. Glue ups can be stressful. To minimize the stress, especially since I was alone and dovetails take longer than most joints to assemble, I chose to attach one end at a time, and leave it to set up. 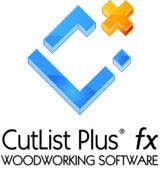 Dovetail joints, once seated, are self holding and require no clamping. 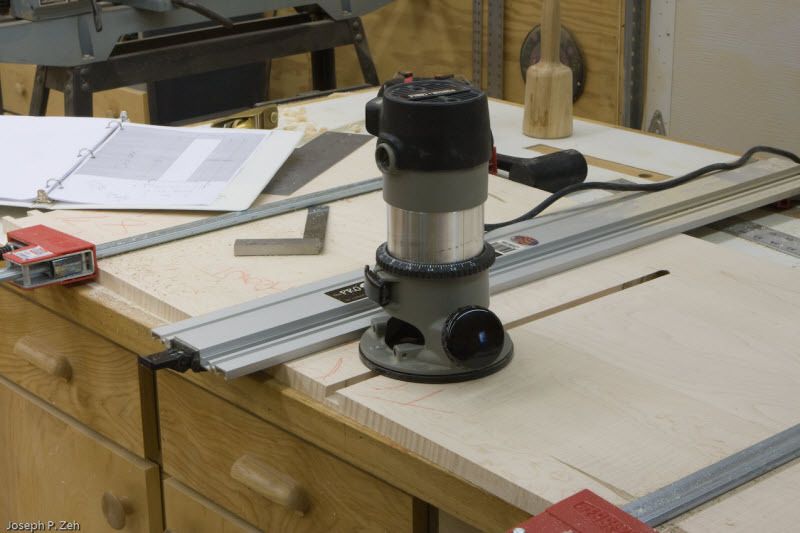 The dado joints, on the other hand, require clamps to be sure they are completely joined and remain that way throughout set up. This is shown right. Shown at left is the assembled structure after set up. 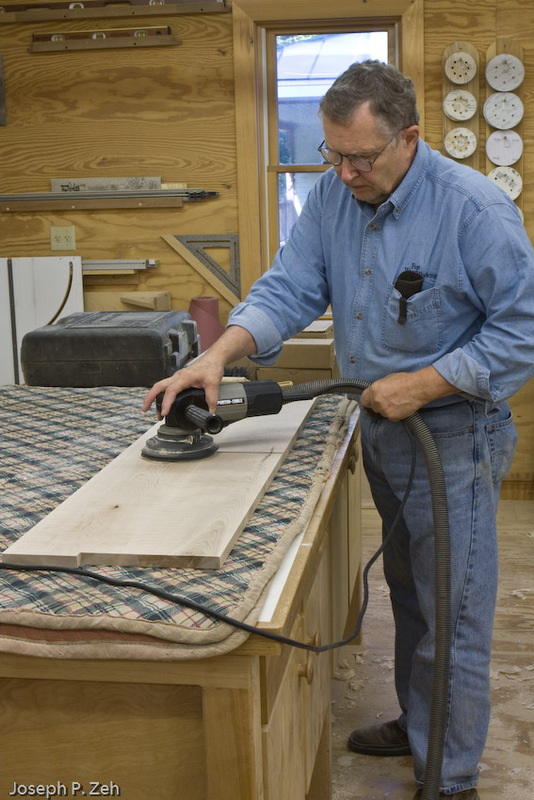 This is the best time to lightly sand the inside surfaces, before the back is added and makes it more difficult. The carcass structure is shown left. The outside surfaces can also be sanded to 220 grit at this time as can the slats and cross members for the back. The back is added next. It just so happens that I have had, laying around in my storage, mahogany bevel edged tongue & grove, 5/16″ thick, 4″ wide slats. Several years ago my brother-in-law was able to acquire them as leftovers from a job he was working on and gave them to me. I have a lot of such things. When I get gifts like this I never know how I will use them, but I know that in time I will. These worked out perfectly on this project, adding just the right amount of contrast to the tiger maple. See the picture at right. This is a particularly fun part of this project; placing the individual tools. Placing the tools is a very personal thing. Each person who would start with the same carcass design would end up with a vastly different arrangement of tools. I am finding this phase to take more time than I initially thought, including a lot of place-and-replace. 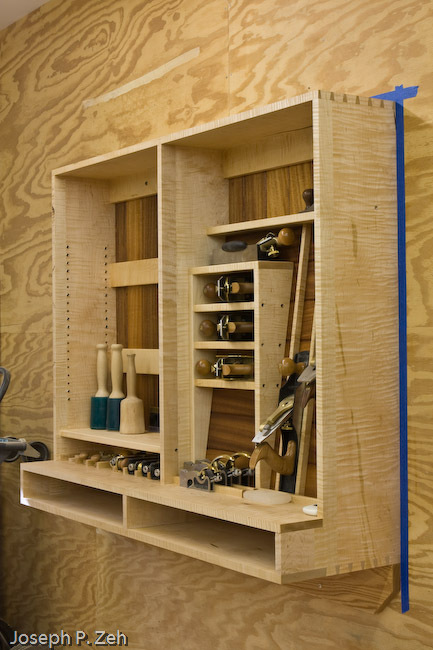 Getting the tool placement right, that is, placed in a way that is natural for the cabinetmaker to access and use, is critical to work efficiency, so it deserves the attention to detail required. Once I have all the tools placed in the carcass I will apply the finish and mount it to the wall. Then I will proceed to craft the doors and drawers. Stay tuned.